Advanced Technology with a soft touch! At Chestnut Ridge Pediatric Dental, our hallmark is our soft touch and friendly care, but we also pride ourselves in using the best technologies available to enhance our quality of care and your child's experience! Chestnut Ridge Pediatric Dental is proud to offer our patients the TLC Media system. This system has two components - a cool, glare-free, fiber-optic dental light, and a monitor/TV screen which your child can watch while sitting up or leaning back in the dental chair. While your child is leaning back, the screen swivels so it is directly overhead; when your child is sitting up, the screen swivels so it is in front of her! Noggin, Nickelodeon, Disney, or ESPN - it's your choice (or your child's)! With the push of a button, we can use the same monitor to show your child her digital radiographs or the intraoral camera video pictures! Have you or your child ever seen their teeth up close? REALLY up close? With our specialized mini-video camera (an "intra-oral camera"), you and your child can see his teeth and mouth like never before! The intra-oral camera lets you and your child see their teeth and mouth up close, allowing you and your child to take part in the diagnosis and treatment planning. Dr. Rachlin knows that a picture is worth a thousand words - especially in dentistry! Just another reason to get your kids excited about visiting Chestnut Ridge Pediatric Dental. Our state-of-the-art digital x-ray system provides you and your child with many advantages. With digital x-rays, less radiation is needed to produce high-quality images. These images can then be evaluated by Dr. Rachlin on one of our large-screen flat-screen monitors, and they can be enhanced and magnified for ideal diagnosis. Just like with our intra-oral camera, the computerized images makes it easier for patients and their parents to see and understand what is happening with their teeth. The Diagnodent tool is an FDA-approved laser used for accurate and objective diagnosis of cavities. Very often, by detecting cavities as they are just starting, we can implement a non-invasive preventive program to prevent them from developing further. Even if there is decay which requires removal and filling, early detection ensures that problems are fixed before they become large, conserving more natural, healthy tooth structure. The Diagnodent shines a tiny laser beam into the tooth and measures how the beam reflects through the tooth structure. This gives Dr. Rachlin an objective measure of the porosity (softness) at the bottom of those deep grooves. It is completely comfortable for your child. For cavity removal, Dr. Rachlin often uses an air abrasion machine, which directs a very fine stream of air and powder towards the tooth. The air stream removes decayed tooth structure quietly, without generating any heat or vibration. Air abrasion procedures can almost always be done painlessly, without using an injection. This often allows painless treatment of multiple areas at the same visit, which saves you and your child time and additional trips to the dentist! We find that children (and their parents!) are very appreciative of how 'easy' their filling appointments are Another advantage is that by minimally removing unhealthy tooth structure, the filling is smaller, and more healthy tooth structure is preserved. 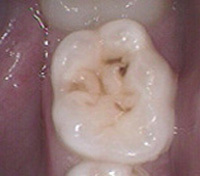 Air Abrasion is also used to thoroughly clean the grooves of back teeth before placing fissure sealants. Carefully cleaning the groves ensures that any bacteria and weakened tooth structure are removed before the sealant is bonded to the tooth, resulting in long-lasting protection for the teeth. Dr. Rachlin performs air abrasion techniques using high-powered magnification, to aid in accurate and precise diagnosis and treatment. For procedures where injections are required, Dr. Rachlin strives to make the experience as comfortable as possible for your child. That's why we use the Vibraject, which vibrates the tip during the injection. It sounds like the vibration of a cell-phone, and it makes the injection feel like a tickling sensation. When used in combination with a careful, slow, injection technique, this makes the injection as comfortable as possible. Many of our patients report not feeling the injection at all!